These on-the-go bars only contain three ingredients: greek yogurt, berries, and crushed-up breakfast biscuits. It doesn’t get much better than that. This is a healthy pizza alternate that actually tastes good. The best part? You won’t feel guilty about eating five (or 50) of them. You can’t beat this high-protein snack. They’re even good with roasted chickpeas, but you can honestly add anything to this mix. Who said dessert can’t be healthy? This vegan-friendly snack only has a few ingredients, but you can totally mix and match. You can add in things like dates or swap out the maple syrup for honey. A win-win situation. If you’re ever craving something salty and crunchy but don’t want to indulge on potato chips, sliced cucumbers with soy sauce is a great alternative (and here’s a way to elevate that even more). 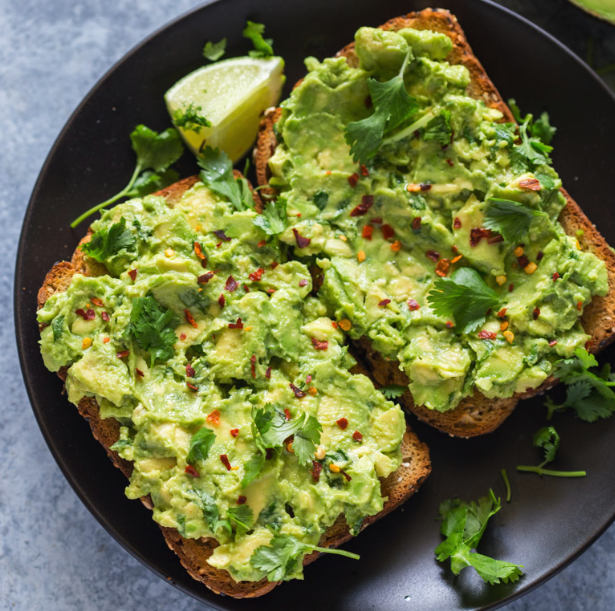 Add your favorite seasoning (like Adobo) to some avocado slices for a quick and nutritious bite. It sounds really simple, and that’s because it is. Rice cakes may seem boring, but they’re a great substitute for bread if you’re trying to watch your calorie intake. You can spice it up with any kind of toppings, but you can’t go wrong with classics like peanut butter and banana. There’s no added sugar, and you definitely won’t feel guilty if you eat 100 of these. This banana-based dessert is sort of like a smoothie but has the consistency of gelato. It’s got a bunch of protein, no added sugar, and only takes about five minutes to make. These no-bake granola bars take practically no time to make, and you can fill them with any ingredients you want. They’re a little higher in protein and fat, but that makes them great energy boosters for hiking or traveling. I love almonds, but let’s be real… sometimes they can be pretty bland. Add these spices for a flavorful and healthy kick, and you’ll never go back to eating plain almonds again. If you’re in the mood for chocolate chip cookies but trying to eat healthier, look no further. This is the ultimate substitution guaranteed to satisfy your cravings. Greek yogurt? Yum. Granola? Yum. Strawberries? Yum. Cream cheese? Yum. You literally can’t go wrong with this simple, delicious, and healthy snack. Making air-popped popcorn lets you control the amount of butter, oil, and salt that’s added to it, so this cinnamon bun variation is actually healthy (and it even lets you add your favorite protein powder mix). It’s a really cool alternative that’ll satisfy any mood your tastebuds are in. A lot of people swear by eating a handful of frozen grapes on a hot summer’s day. And they’re right. But this elevated approach is just as simple and even more delicious. This is the ultimate keto diet (low-carb, high-fat) snack. Baked salami and pepperoni taste SO good, and they pair even better with a roasted garlic white bean dip. You’re welcome. 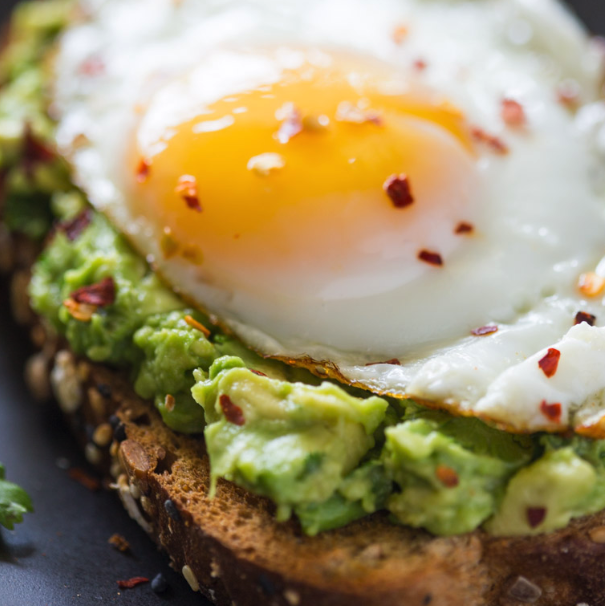 Avocado toast can be as simple (avocados + seasoning) or intricate (avocados, eggs, veggies, etc.) as you’d like. 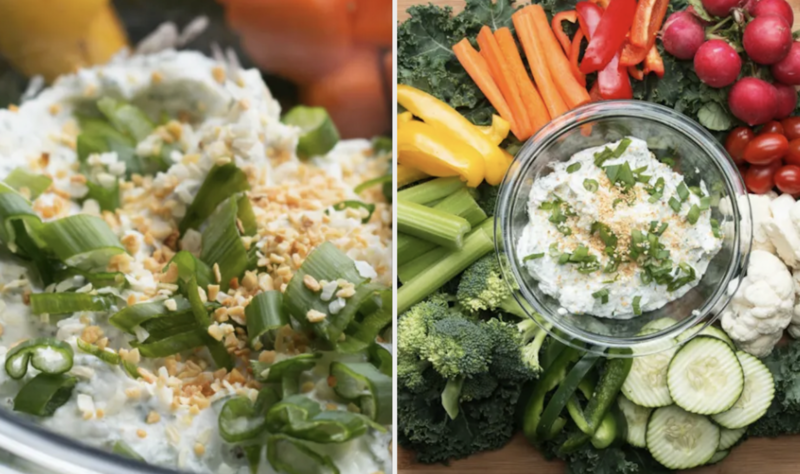 These two variations are both healthy, easy, and delicious.